Morton Feldman’s “Triadic Memories” unfold in a realm of shadows. The droplets of notes and meticulously spaced-out clusters that make up this hourlong work for solo piano range from the very quiet to the barely audible. But it’s their afterlife that the ear is drawn to, the aura of resonance that hovers below the grand piano’s wing long after a key is struck. On Thursday at the Baryshnikov Arts Center, the pianist Pedja Muzijevic offered a mesmerizing reading of the piece that deepened Feldman’s music through lighting and dance. In “Framing Time,” part of Lincoln Center’s White Light Festival, the precise and enigmatic movements of Cesc Gelabert (in his own choreography) brought out the work’s ambivalent mood, somewhere between playful curiosity and aching melancholy. Paper-lantern-glow sets and lighting by Burke Brown deepened the mystery. The previous night at the penthouse, the refined pianist Pedja Muzijevic presented a program that Mr. Langrée might look to as a template for enlivening the orchestra’s concerts. With the program “Haydn Dialogues,” Mr. Muzijevic alternated vibrant accounts of four Haydn sonatas with contemporary works by Jonathan Berger, George Crumb and Morton Feldman. Heard in the context Mr. Muzijevic devised, Feldman’s radical use of moments of silence in his moody “Two Intermissions” (1950) had surprising commonalities with Haydn’s humorous late Sonata in C, which often unfolds with impish pauses between phrases. The "Haydn Dialogues" is a testament to the idea of music as an experience that doesn't always warrant a clear explanation. The connections between Muzijevic's pairings are exactly as you hear them, and exactly as your neighbor hears them. Whether your experiences match matters less than whether or not you both enjoyed yourselves. It is possible to take "serious music" too seriously, and with the "Haydn Dialogues," Muzijevic invites us to savor. To extend the cooking metaphor: the exact ingredients matter less than their combined effect. Most of us don't spoil an invitation to dinner party by pestering our hosts with questions about what spice gives a dish its sweetness, or what technique was used to bring out the bitterness in the vegetables. Not that there's anything wrong with such questions; chefs both amateur and professional may thrill at such details. But isn't the point more often to enjoy the meal? By that measure, Muzijevic's "Haydn Dialogues" is like tapas and a julep on the piazza on a summer night: simply delightful. Pedja Muzijevic delighted the audience at Walter Hall last evening with a piano recital that was distinctively different from most. Instead of performing the usual repertoire of 19th and 20th century composers, he delivered a program focussed on four sonatas by Joseph Haydn interspersed with music by composers of today. The differences didn’t begin and end with the repertoire however. Muzijevic’s approach to the concert entitled Haydn Dialogues was somewhat casual in that he remained on-stage for the entire program and spoke with the audience between works. He organized the program in such a way as to expose the contrasts between Haydn’s early and late works as well as between the music of the 18th century and that of three renowned contemporary composers. He reminded the audience of the context of Haydn’s music. By juxtaposing the Haydn and contemporary works, he also demonstrated that music of both eras can reach out and touch us in similar ways. He did all this with understated wit and joyfulness. That must be why Nuttall programmed the effervescent Piano Sextet, op. 110, by the precocious 15-year-old Mendelssohn. It’s sort of a piano concerto with string accompaniment, and Muzijevic played its thrillingly quick first and third movements, and its lovely middle movement, with plenty of technical mastery and musical nuance. Bosnian-born, Juilliard-trained pianist Pedja Muzijevic, one of TSM's mentors, headlined the American Avant-Garde evening, yet another example of thoughtful programming. It began with Muzijevic reading John Cage's 32 Questions, which the composer originally used in a talk at Darmstadt, West Germany in 1958. An example of Cage's wit coupled with his fresh way of approaching the concepts of sound and music, the questions set his The Seasons (1948), the concert's opening piece, in a Cagian context, with the filigrees of “Spring” brightly played and sensitively nuanced, “Summer” balmy and spare, dynamically well-shaped, the harsh atonal chords of “Autumn” giving way to the stillness of “Winter's” prelude. Muzijevic, who is the artistic administrator of the Baryshnikov Arts Center in Manhattan, recently performed The Seasons in New York along with Cage's questions. In Toronto he added a welcome bonus. Between the second and third seasons, he inserted Morton Feldman's first two Intermissions, very spare, brief and quiet works reminiscent of Webern, which he played with impeccable flair. Concert programmers often work hard to create thematic links between seemingly unconnected pieces and events. So it was refreshing to hear the pianist Pedja Muzijevic say lightheartedly, when introducing a performance at the Baryshnikov Arts Center that juxtaposed John Cage with a Mozart piano quartet, that there was no particular formula behind the choices. But there were certainly links, as well as an appropriately salonlike spontaneity. Mr. Muzijevic pointed out that Mozart’s Piano Quartet in G minor was written for an informal setting, like the center’s Howard Gilman Performance Space, where Mr. Muzijevic, the cellist Edward Arron, the violist Max Mandel and the violinist Tessa Lark offered a vigorous, congenial performance on Monday evening that included readings. “Mozart would have been shocked if you didn’t applaud,” Mr. Muzijevic said after a lively outburst of applause following the first movement rather than the usual moment, at the end of the work. He said the choice of texts — sensitively read by Deborah Eisenberg and Wallace Shawn — reflected his own tastes and favorite authors. Poems by Samuel Beckett, “What Is the Word” and “Roundelay,” segued into Luciano Berio’s Sequenza VII for oboe. Mr. Muzijevic offered a sensitive rendition of John Cage’s enigmatic “The Seasons,” inspired by the Native American concept of seasons. Cage wrote the piano version first and later orchestrated it for a ballet by Merce Cunningham. A reading from Cage’s lecture, “Communication,” exploring the different meanings and interpretations of noise and music, seemed a fitting theme for such disparate pieces. Surely, anyone in the audience who wasn't a Haydn fan became one after Pedja Muzijevic's performance of the Sonata in G Major, a relatively short piece in two movements. Muzijevic paced the first movement Allegretto nicely, though he seemed to anticipate what was to come, hurrying into the spirit of the Presto a bit early. The second movement highlighted the pianist's skills, with remarkably even runs and spot-on articulation. Last Saturday night, the energized and engaged sounds of Pedja Muzijevic filled the musically anointed space of Brooks-Rogers. Muzijevic, a visiting artist and pianist showcased his crisp, electric talent throughout the night, performing works ranging from Haydn’s upbeat “Sonata in G Major” to 8 of the 20 movements of Schumann’s Carnaval, op. 9. Critics laud Muzijevic as a “thinking musician,” with a captivating stage presence revealing the prosperous fruits of a 35-year-long career. Throughout this career he has and continues to perform at festivals such as Tanglewood, Spoleto and Mostly Mozart. Likewise, his symphonic engagements are similarly impressive. He has performed with the Atlanta Symphony, Residentie Orkest in the Hague and the St. Paul Chamber Orchestra among others, also committing to solo recitals at such venues as The Frick in New York City and the National Gallery in Washington D.C. It’s not a surprise that The London Financial Times deemed him “a virtuoso with formidable fingers and a musician with fiercely original ideas about the music he plays.” The pianist certainly demonstrated some of these original ideas, interjecting the musical component of his performance with witty, intellectual comments on the histories and characters of the pieces he was to play. Energy peaked before intermission, in the brief Third Concerto, which had its movements linked by harpsichordist Pedja Muzijevic's improvisation on a fragment of Bach's Toccata in E minor. Where the rest of the program was sonorous, this Third "Brandenburg" proved electric. Outstanding among the soloists were Muzijevic (in the Fifth Concerto); David Washburn, trumpet (Second); Cynthia Phelps, viola (Third); Daniel Phillips, violino piccolo (First); and Alexander Sitkovetsky, violin (Fourth). Pedja Muzijevic, on harpsichord, provided a crisp backbone for all the concertos and in the Fifth — an early premonition of a keyboard concerto — he contributed an exhilarating, wildly chromatic cadenza. The concert ended with an undisputed masterpiece, “Symphony of Psalms,” in a well-made reduction for two pianos by Karen Keating. Any disappointment in missing Stravinsky’s pellucid orchestral writing was mitigated by the sparkle of the pianists, Pedja Muzijevic and Steven Beck, and in the brilliant singing of the choir and the Trinity Youth Chorus. If you like your music with unfettered, heart-on-sleeve emotional passion, rich romantic sentiment, and more than a touch of womanly intuition (sorry, guys — we can’t go there), Amy Beach is for you. And she has all the compositional skills she needs to express her feelings convincingly in music, and more. The SLSQ, the day’s workhorse, took good care of this one, joined by versatile keyboard whiz Pedja Muzijevic (also a noted harpsichord player), who took over at the piano. In the course of the work’s three movements, they were in perfect tune with their composer, realizing everything from her tender wistfulness and yearning romance to her elfin playfulness and crashing drama. We then got a radically different but equally unusual mid-concert interlude of two late works by the great romantic-era virtuoso pianist and composer Franz Liszt. Many classical fans look down on him as a composer, since he’s best known for his flashy, ultra-virtuosic display pieces that, for quite awhile, only he could play. But many are unaware that, particularly toward the end of his comparatively long life, Liszt was the most original and far-seeing composer and musical progressive of his day. He pioneered new approaches to harmony and musical methods that presaged the radical “new” compositional movements of the 20th century, like French impressionism (among others). We heard two of his short piano pieces typical of such experimental purpose: Schlaflos! Frage und Antwort (Sleepless, Question and Answer) and Bagatelle sans Tonalité (Bagatelle without Tonality). They both offered musical premonitions of more modern compositional characteristics to come, like atonality as well as a more chromatic approach to harmony. Sandwiched in between the two numbers was another short number: Intermission I by Morton Feldman, one of America’s most radical avant-garde composers of the century just past. The purpose, as pianist Pedja Muzijevic explained to us before he played the pieces, was to demonstrate that there were real similarities between the two composers’ sounds and methods, even though they lived and worked a century apart. This was a timely and fascinating bit of advocacy in support of the contention that the role and importance of Liszt are ripe for re-evaluation. Pedja delivered the pieces to technical perfection (Liszt never stopped showing off his keyboard chops), on top of giving us a short but revealing musical lesson. Over the next two weeks, the St. Paul Chamber Orchestra is delivering Brandenburgs by bus, peregrinating about the metro area with five of Bach's six Brandenburg Concertos on its itinerant program. The tour began at Apple Valley's Shepherd of the Valley Lutheran Church on Thursday night, and it bore the buzz of a highly anticipated event before a single note was played. The SPCO musicians rewarded the audience with a concert brimming with energy and exceptional musicianship. The Brandenburgs are, in many ways, an ideal vehicle for the SPCO's skills. These works for ensembles of varying sizes show off how well they fulfill both the "chamber" and "orchestra" parts of the SPCO's name, and allow several members to demonstrate what outstanding soloists they are. On the latter account, the most prominent standouts came in the first half of the evening. The orchestra's concertmaster, Steven Copes, put forth some incendiary violin work in the final movement of the Fourth Brandenburg, full of furious bowing and rapid-fire digital dexterity. Matching him with a show-stopping solo was a guest artist, harpsichordist Pedja Muzijevic, who practically torched the keys on the harpsichord on the opening movement of No. 5. It was the kind of solo that could make you want to explode into applause as if at a jazz club. But tandems and trios provided plenty of inspiring moments as well. The most dynamic duo was Sabina Thatcher and Maiya Papach, the violists who made No. 6 a dark, moving meditation. The slow movement was sad and sweet, sounding like a conversation of commiseration after a loss. In the finale, they seemed to be finishing one another's phrases as if in enthusiastic agreement. And there were plenty of threesomes who sounded equally arresting, especially in the closing No. 1, a trio-laden treat. It was an ideal cap to a concert full of ample evidence that this is one grand Bach band. Mozart's Piano Concerto No. 20, the sublime D-minor masterpiece, is all about touch and balance, storm and pathos. It is performed frequently but can be interpreted so many ways that it remains fresh. Bosnian pianist Pedja Muzijevic, an interesting musician, was here making his Atlanta Symphony Orchestra debut, as was the conductor. Although his touch at the keyboard sounded acidic and tinny -- the fault of microphone placement or audio engineers twisting knobs, most likely -- he crafted an uncommonly compelling role for the piano, as a personality in direct communication with the orchestra. He ornamented his singsongy phrases neatly, and with Llewellyn's assistance, brought the middle movement, almost a garden serenade, to a gorgeous, peaceful ending. In this concerto, most pianists play Beethoven's cadenzas -- those extended solo passages that offer the soloist a flight of fancy -- since Mozart's own have been lost. Muzijevic instead played cadenzas composed by Paul Badura-Skoda (in the first movement) and J.N. Hummel (in the third). It was a small point but well taken: Muzijevic is a thinking musician, eager to go his own way. As occasional chamber-music series in Manhattan go, the Movado Hour at the Baryshnikov Arts Center is a hard one to beat. True, its offerings are limited to a handful scattered throughout the season. But for five years now, Pedja Muzijevic, the music director for the center and a versatile pianist of broad, eclectic tastes, has presented some of the world's finest singers, instrumentalists and ensembles in this series of casual, free concerts. The concerts, usually reserved well in advance to a capacity of about 200, are held in what is now called the Howard Gilman Performance Space, a suitably intimate setting in this burgeoning arts hub. Audience members mingle at tables and in rows of folding chairs behind them. Attending, you feel like you're part of a familial conspiracy, watching distinguished performers working out their next moves or patching together disparate pieces with a wholly personal logic. The concert ended with Faure's Piano Quartet No. 2 in G minor, elusive, ravishing and too seldom heard. Mr. Nuttall and Mr. Muzijevic were joined by the violist Hsin-Yun Huang, formerly of the Borromeo String Quartet; and Nina Maria Lee, the Brentano String Quartet cellist. A pick- up band it may have been, but the players congealed convincingly; the music was appropriately stately and wistful, with a thrilling wildness in the two Allegro molto movements. The grand finale was Schumann's best-known chamber work: the ultra-exuberant Piano Quintet. This gushing masterpiece is more typical of Schumann's bipolar nature, with constantly shifting moods and emotions that never fail to keep listeners on the edges of their seats. And the SLSQ's wonderful players, along with Pedja Muzijevic (this time on piano), gave it by far the best and most exciting performance I've ever heard, even on recordings. The group's vital and spontaneous style fit the music perfectly, as they stunned their listeners with particularly wrenching mood-swings and passionate outbursts. It left us all limp with emotional exhaustion — but not limp enough to stifle our hearty standing ovation. The concert featured Bosnian born-and-trained pianist Pedja Muzijevic, who now lives in New York. With wit and humor, Muzijevic addressed the audience before most pieces, offering fascinating commentary and personal anecdotes about the composers and their unusual music. Foregoing any introduction, Muzijevic launched into the 'surprise piece' of the evening: Cage's 4'33". named because the performer is supposed to sit at the piano for that length of time without playing. Most of the audience seemed well-prepared for this surprise, though a murmuring few were heard questioning the validity of this piece. Actually, Muzijevic's silence exceeded the work's specified time, in what could only be called a rather sluggish rendition. To play sonatas IV, V, VIV and XV from Cage's "Sonatas and Interludes for Prepared Piano," Muzijevic moved to a second piano in which he had carefully inserted screws, bolts, rubber, and plastic between certain strings according to the composer's detailed instructions. The result was a marvelous mix of timbres including percussive sounds resembling an Indonesian gamelan. Muzijevic's approach to playing these sonatas revealed both his deep insight into Cage's compositional aesthetic and his mastery of the touch needed to produce the exotic timbres. This was a musically challenging concert for the audience that was made immensely enjoyable by creative programming, remarkable playing and Muzijevic's endearing personality. Spano opened with a recent work, Jennifer Higdon's "blue cathedral," and continued with Mozart's Piano Concerto No. 25 - with the fine Pedja Muzijevic as soloist - and Bartok's Concerto for Orchestra..... The Mozart concerto held attention for different reasons. Muzijevic acknowledged Classical tradition by playing blissfully along with the orchestra even when the piano part didn't require it. As soloist, he shaped lines with chipper energy and added all sorts of tasteful decorations, even in the extended phrases of the slow movement. Muzijevic offered a first-movement cadenza, by Mozart contemporary Philipp Karl Hoffmann, whose elaborations might have intrigued the composer. The pianist's liveliness sometimes spilled over into rambunctiousness in the finale, but his music-making was so vital that it kept all ears glued to the sublime discussions. Spano's collaboration was alert and balanced, with superb winds placed in fine relief to silken strings. Pianist Pedja Muzijevic has performed several times at Maverick Concerts in previous seasons, both as soloist and ensemble player. But he has never made as strong or positive an impression on this listener as he did on Saturday, July 24. The first half of Muzijevic's program was a kaleidoscope of mixed repertory. Three Scarlatti Sonatas were separated by works of Feldman and Cowell. The Scarlatti playing was pianistic but stylish, with all repeats and even a few added trills. The Feldman, a Webernian Intermission, was convincingly shaped; and Cowell's Floating was also excellently done. Muzijevic continued with Conlon Nancarrow's Tango, written for human pianist but scarcely less complex in its rhythms than his player piano music, a great challenge and an impressive performance. Godowsky's transcription of Strauss's Staendchen was followed by Cowell's Fabric, and I was sure I heard a similarity in the figuration of each piece. Muzijevic concluded the first half of his program with the Novellette, Op. 21, No. 8, by Schumann, not very familiar music. He played it with good tonal quality and lots of romantic impulsiveness, a thorough success....Muzijevic then launched immediately into the Liszt transcription of the Liebestod from Wagner's Tristan und Isolde. I hadn't remembered this pianist playing with such tonal resources and coloration in the past, perhaps the fragility of my memory, but he gave us a thoroughly satisfying performance. In taking on Schumann's Carnaval, Muzijevic was competing not only with the many glorious recordings by pianists of the past (beginning with Rachmaninov) but, in my memory, with a gorgeous performance by Nikolai Demidenko at SUNY New Paltz's PianoSummer only last week...He characterized each section convincingly, playing with a gratifying combination of virtuosity and eloquence. The concluding March was appropriately heavy-footed, a fine depiction of the Philistines who are then routed by lovers of great music like Schumann's. Listening to the almost peerless musicianship of pianist Pedja Muzijevic left the music lover in speechless wonder, grappling for apt superlatives. The best way I can think to describe Pedja Muzijevic's piano performance this past Friday is as a musical juxtaposition which contrasts the concepts of sanity and lunacy from classical compositions to modern makes of madness. While this is a bit more flowery than Muzijevic describes his own act, it is certainly the theory behind it. 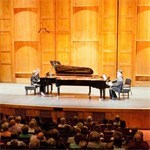 With a piano recital such as the one at Gibson, what people stereotypically expect is the classics, Mozart and Beethoven. Not only does Muzijevic shatter this expectation by placing side-by-side olden compositions with more recent works, the soundness of mind that went into each piece seems to fluctuate as well...Muzijevic didn't just dive straight into a barrage of different sounds, as it might seem. He gradually brought the audience into his performance with a classical introductory piece, Sonata in F Minor, K. 519, by Domenico Scarlatti, and from here moved the evening in and out with classical creations and avant-garde conceptions...The comparison between pieces is rather interesting too, and even humorous. Whereas Scarlatti's modestly described Exercises flew across the piano in incredibly intricate combinations of notes, Morton Feldman's Intermission pieces in turn would hold maybe twenty notes in three minutes time...At the same time, Muzijevic, without a doubt, did great service to each piece on that individual level. He played each piece immaculately (and by memory), providing the listener with an emotional journey and vision every time...Muzijevic's performance was rather unconventional, but this isn't to say bad. On the contrary, he gave a spectacular show, and watching his radical movements as he became more involved in his music was just as entertaining as the songs themselves. During the first week, it was fascinating to hear the St. Paul Chamber Orchestra play, back to back, two essential but utterly different Viennese works calling for (more or less) 13 wind instruments: Mozart's Gran Partita in B flat, K 361, and Alban Berg's Double Concerto, op. 8. Conductor Boyd, who has made a splash heading the Manchester Camerata, projected the sublime beauty of Mozart's slow movements and, with excellent contributions from Pedja Muzijevic (piano) and Steven Copes (violin), led an arresting account of the Berg, although the first movement, with its Viennese waltz, might have had more playfulness. The Chamber Orchestra of Europe offered a vibrant performance of Tchaikovsky's Souvenir de Florence, a wonderful big-scale piece for strings too often eclipsed by his Serenade for Strings. A luminous performance of the Fifth Piano Concerto, known as the 'Emperor' with the Bosnian-born pianist Pedja Muzijevic followed. Rather that treating the work as a virtuosic vehicle, Muzijevic offered an interpretation of sustained poetry that reached deep. Instead of thundering bass power or brilliant treble flights, he dazzled with the subtlety of his thoughts, the sureness of his control, the quickness of his response, and the acuteness of his listening to the orchestra and , above all, to Beethoven. He made the audience feel as if he and they were hearing the work for the first time. Again and again he surprised with a slight hesitation in a line, or a sudden pulling back at the top of a phrase, or the warm shaping of a virtuosic passage. His tonal palette defied logic as he matched colors with the woodwinds or molded dynamics with the flexibility of a string player. The rare quality of his collaboration and his golden musicianship brought both audience cheers and the ultimate orchestra tribute of tapping stands and stamping feet. What we heard was artistry worthy of such a resume. Muzijevic is a virtuoso with a big, bronze tone, imagination and technique to spare, and a multifaceted expressiveness. With the first notes of Chopin's Polonaise-fantasie, it was evident that we were hearing an artist with personality.....Muzijevic's Schumann is more imaginative than neurotic, and this approach works better with Carnaval than with some of the composer's other works....To play this well, one must have steel in the hands, love and affection in the heart, and more than a little craziness. Muzijevic was more than equal to the demands, and his performance was among the best I've heard of this popular work. Ives's young friend Elliott Carter, now entering his second century, is still a bright light of American music. In 'Oppens Plays Carter' (Cedille), the pianist Ursula Oppens gathers nearly all of Carter's solo piano music-from his Piano Sonata (1945-46) to 'Matribute' (2007)-onto one disk, delivering it with a mix of grit and grace. The pianist Pedja Muzijevic accomplishes an equally impressive feat in 'Sonatas & Other Interludes' (Albany), an odd but compelling album that alternates short works for prepared piano by John Cage with compositions by Liszt, Schumann, and W. F. Bach. The pianist performed with real elegance and lyricism and a dose of formality that added just the right amount of spine to his flawless lines. The evening opened with another work that helped the bicentennial celebration, Beethoven's quirky Fantasia for Piano, Chorus, and Orchestra ('Choral Fantasy') with the brilliant pianist Pedja Muzijevic at the keyboard. The work's first performance was in 1808 (the very year Greensboro was founded) with the composer as pianist (who improvised the opening section). While this work is often viewed as a warm-up for the composer's Ninth Symphony, with its combination of orchestra, soloists and chorus, it also serves as a mini piano concerto, beginning with an improvisatory passage that was flawlessly and seemingly spontaneously played by Muzijevic. Like the Ninth, this piece uses a theme and variations layout that culminates in a boisterous choral climax. One can definitely hear that this tune (based on a song Beethoven had written much earlier) has much in common with the more famous 'Ode to Joy' theme. Orchestra, soloists and the Choral Society of Greensboro (under the direction of Bruce Kiesling) turned in a strong reading of the work. In my current rotation of listening is a CD of piano music by John Cage as played by Bosnian-born pianist Pedja Muzijevic (on Albany Records). For no particular reason, he intersperses the short, fascinating sonatas and one interlude with music by such diverse composers as Scarlatti, Liszt and Schumann. The effect is seamless. It isn't new music or old, just music. It works because Muzijevic is simply playing music that he likes, applying the same enthusiasm and technical wherewithal in equal doses. The unexpected discovery was Pedja Muzijevic, whom (I would suspect) no one in the audience had heard of before; I certainly hadn't. Few experiences are more exciting for a critic than suddenly being made aware of a heretofore unknown first-rate musician, and when the musician has the startling originality of this Bosnian-born pianist the experience is heady indeed. Everyone plays these pieces from Ravel's Miroirs and Debussy's two sets of Images, and a whole series of great pianists have played them exquisitely. I would not have supposed they could sound as utterly new as Muzijevic made them. Ordinarily, pianists emphasize the sensual and pictorial qualities of this music: the rippling of the water in the goldfish pond, the misty atmosphere out of which the sounds of the distant church bells emerge, the fiery espagnolism of the jester's morning song. Muzijevic, in contrast, underlined their musical structure, the shapes of their motifs, the ways their phrases and sections are put together. To this end he pedalled with extraordinary delicacy, so that instead of merging in an impressionistic haze, all the sounds (above all, the harmonies) remained completely distinct. The result was to focus the listener's attention on how this music differs from Romanticism, to enable us to perceive the crispness and lucidity of the piano writing, and to make us aware - something most performances leave obscure - of the modernity of Debussy and Ravel (yes, Ravel too). I don't mean to imply that there was anything dry or pedantically analytical about Muzijevic's playing. On the contrary, the sound spectrum in La vallee des cloches was ravishing in its palette of nuanced colors, Alborada del gracioso was intense and explosive in its rhytmic drive, and Hommage a Rameau was unusually grand and noble in its deliberate, expansive pacing. By treating these works less as 'impressions' and more as pure music, the pianist made them far more gripping that what one ordinarily hears in them. Muzijevic accomplished something rare in the first half of the program; he held the audience spellbound, playing three Liszt pieces without the interruption of applause or even rattling paper. Moving from two late works written in the composer's experimental, almost atonal style, to Liszt's bravura transcription and reworking of Isoldes Liebestod from Tristan und Isolde, Muzijevic's sensitive and nuanced interpretation was arresting. Which brings us to Hans Werner Henze's 'Tristan', performed Friday night by the Milwaukee Symphony Orchestra and pianist Pedja Muzijevic, led by Andreas Delfs......A measure of relief also lies in the extended piano solos. The melodic contours here, too, are as spiky as a deathbed EKG. But Muzijevic played them with such gorgeous legato and phrased them so compellingly as to round off the sharper points. He made the solos ruminative, in the way that jazz pianists sound ruminative as they explore chords and warm their way into a song. The piano's introspection made a nice contrast with the explosive, let-it-all-hang-out orchestral music. Beethoven's First Piano Concerto in C Major, op. 15 was in the center of the attention. Pedja Muzijevic brilliantly interpreted this virtuosic and spirited work, with an interesting combination of composer's first movement cadenzas. He played an inspired rendition of the Rondo in a lively tempo that did not take away the ease and elegance from the performance. His free rubato phrasing had a solid base in a precise rhythm. Maestro Uros Lajovic expertly controlled and lead the Zagreb Philharmonic in a fine dialogue with the pianist. Pedja Muzijevic, the Croatian pianist performing the concerto (Beethoven #2) Saturday with guest conductor Gabriel Chmura and the Richmond Symphony, played it more for its Mozartian brilliance and clarity than for hints of the Olympian Beethoven to come. Crisp and straightforward in the fast outer movements, Muzijevic conjured a small miracle of timing in the solo cadenza of the first movement. He saved most musicianship for the central adagio, emphasizing its spare lyricism and at the end playing extraordinarily softly yet projecting throughout the hall. Pedja Muzijevic, a Bosnian-born pianist, was stunning in the monstrously difficult piano part (Henze Tristan Preludes), coming accross as an actor, speaking eloquently in a foreign tongue, the language being atonality. The musicians of the Milwaukee Symphony Orchestra played in extremely concentrated, peak form. The choice of Sunday-afternoon pianist proved the adventurousness of Aldeburgh's programme-planning. Pedja Muzijevic, a young Yugoslavian resident in America, is a virtuoso with formidable fingers and a musician with fiercely original ideas about the music he plays. His playing was like a refined hunger, taking sharp, exaggeratedly emphatic bites which sounded right in Janacek. There is a powerfully persuasive personality at large here; and with recent scores by Knussen and Corigliano he turned his recital into an almost encyclopaedic demonstration of stylistic sympathies. I was impressed. The series Great Pianists at the Teatro Municipal opened triumphantly with the virtuoso pianist Pedja Muzijevic....A separate paragraph is warranted for the interpretations of the pages of Franz Liszt; most notably those special, visionary ones, full of harmonic freedom, that were completed toward the end of the century. More popular works, such as Funereilles and the Valse oubliee No. 1, were played with strong dramatic contrasts and a fabulous touch of distinction and transparancy. In the piano version of Wagner's Isolde's Liebestod, Liszt reaches an ecstasy born of madness and Muzijevic knows how to communicate, with a magic empathy, the extreme degree of delirium." For all its impetuosity and fire, the Mendelssohn concerto abounds in classical virtues of clarity and balance. Muzijevic dared to play it that way. He didn't try to sell the piece, to wow the audience. He gave his performance - thoughtful, clearheaded, lyrical - and drew in his listeners, which is no small achievement given the chattiness of his Pops audience. In the agitated first movement, his rippling scales and fluid passagework were uncommonly handsome. He played with roominess but didn't dawdle during the long-arched melodies of the Adagio. And with his supple wrist technique, he dashed through the buoyant, bouncy finale with delicacy, elegance and exuberance. Muzijevic played with varied and luminous tone colors; he voices chords and interviewing lines with attentiveness and clarity, and makes notey passagework sound thematic as well as coloristic. This was a striking debut. Luckily concert pianist Pedja Muzijevic held everyone's interest by following it with 'Intermission No. 1' by Morton Feldman, executed with such expression that he could have trumped an entire orchestra. Muzijevic has been one of the musical collaborators for the evening, and his own four solos showed inventive and beautiful programming. His selection of the lyrical 'Serenade' from Richard Strauss and Leopold Godowsky sent us scrambling for programs to memorize the title. The greatest revelation, in fact, was the brilliance of pianist Pedja Muzijevic, who not only accompanied Baryshnikov, but played several musical interludes, as well. The Bosnian musician's playing was so clean and so finely articulated that it revealed all manner of musical lines that most performers would have left in a thicket of musical glop.